We’re now at 61 days since planting for my first generation of mini-maize and the kernels are just about fully mature. Mini-maize ear 61 days after planting. The seed set isn’t wonderful. Unfortunately the tassel is really delicate on this genotype so this generation we only got one batch of pollen per plant. Next generation we’ll try to handle the tassels even more delicately, which will let us harvest 2-3 days worth of pollen and should result in more of the ovules on the ear being fertilized and more seeds produced per plant. Still, considering we started with a grand total of ten kernels, (of which only two still remain) just this one ear feels like an abundant wealth of kernels! 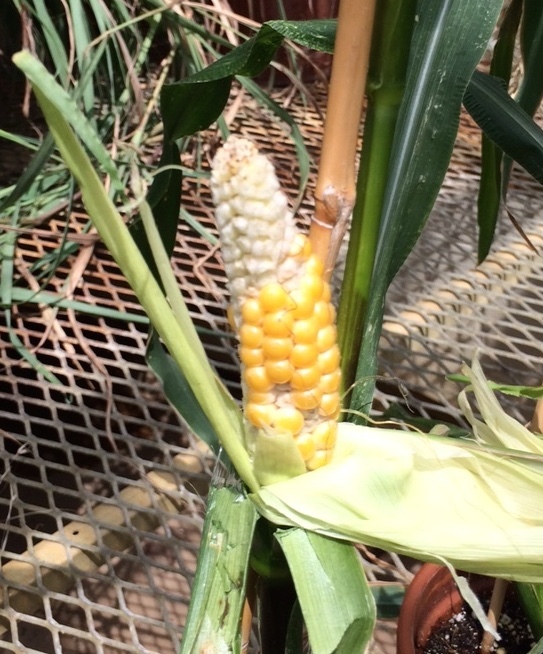 Here’s the link if you missed mini-maize part 1: flowering.